The drop in the economy and the stock market, was the largest decline in the United States since the Great Depression. The unemployment rate was climbing and eventually peaked at 9.6% in 2010. ** Pessimism was off the charts and many wondered if the financial system as we knew it was done and finished. Businesses were closing their doors or laying off employees; no one was hiring or expanding. Survival was the challenge of the day. Most people were saying the glass wasn’t half empty, but that it was completely broken! I often joke that all we needed to turn the stock market and the economy around was for someone to have a little confidence and open a new business, which is what we did. March 9th, 2009, marked the start of the new bull market** along with the start of Modus. I certainly feel better about where we are today than I did eight years ago, and most investors do too! The DJIA has more than tripled from its low point eight years ago, and is trading close to the 21,000 level today (03/09/2017). I wish I could tell you that I knew the market was poised to rebound and that is what led to my confidence, but that wasn’t the case. I was scared like everyone else! We forged ahead though, trusting that the economy and the stock market would eventually recover, which they did. Our clients and our business are better off for maintaining a positive viewpoint, even during the worst of times. Today we stand in a far different place than we did eight years ago. The stock market indices, such as the Dow Jones Industrial Average, are at or near all-time highs, not at bear market lows. The unemployment rate dropped to 4.9% in 2016. *** We are not in financial turmoil, although we are in political turmoil. A new administration has brought a new vision and approach to Washington, and we are in uncharted waters. Is it a time for pessimism or optimism? Is the glass half empty, or half full?!? In the eight years of Modus, we have not made one short-term prediction for the stock market, and we’re not going to start now. The stock market is a fickle animal and today’s trend can be turned upside down very quickly. What I do believe stands as true today as it did eight years ago is this: A disciplined investment strategy, combined with sound financial planning and a long-term approach, doesn’t go out of style. No one can guarantee success, but you will put the odds on your side if you stick to a solid plan in the good times and bad. Staying optimistic along the way will probably help too! Happy Birthday bull market, eight years running, and time will tell if the bull makes it to nine. 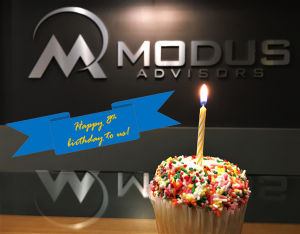 And a heartfelt “Thank you!” to all of our clients and friends who have helped make this a special birthday for us at Modus Advisors! We remain optimistic about your financial future!! * Investopedia, The Fall Of The Market In The Fall Of 2008. ** America’s 7-year bull market. CNN Money, March 9, 2016. *** Bureau of Labor and Statistics, United States Department of Labor. The Dow Jones Industrial Average is comprised of 30 stocks that are major factors in their industries and widely held by individuals and institutional investors. All indices are unmanaged and may not be invested into directly.